No scans at the moment, but COCOROGs blog contains an abundant amount of info from the latest Coro Coro. Transformations in this game are referred to as "Noise Changes" and are described as mutations that are allowed by attaining a certain level of Noise and are the result of Noisy Waves coming from Meteor G (a giant meteor headed toward earth). 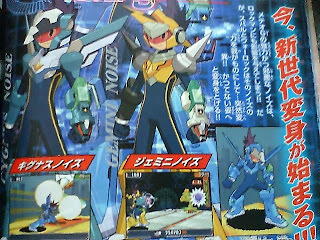 When the level of Noise decreases, Rockman will automatically revert to lower level forms during battle. So far, there is a mention of Noise Changes based on a large amount of FM Seijin from the first game. -Ox Noise is described as a fire-based form that will boast high attack power and use of the fire element. -Libra Noise is described to make use of a fusion of fire and water and will also boast high defense properties. -Cygnus Noise will grant high speed as well as wings, which will likely grant Float Shoes. -Ophiuchus Noise uses the power of poison and snakes and is labeled as the strategic form. -Gemini Noise a powerful form that makes use of electricity and probably boasts extra special abilities regarding Battle Cards, such as Side Select. 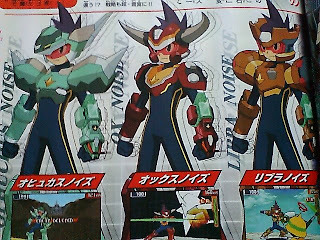 There are said to be more transformations, and next month's CoroCoro will supposedly reveal the ultimate transformation. It is mentioned in the report that Subaru will have a new catchphrase when performing Denpa Henkan and becoming Rockman. He will now say "Trans Code! Shooting Star Rockman!". Not totally confirmed, but it seems there is a mention of the side camera view that we all love from the EXE series? Let's keep our fingers crossed. Finally, the report mentions a change in appearance for the custom screen. Perhaps the custom screen selection will be a lot more complicated than merely selecting down a column. 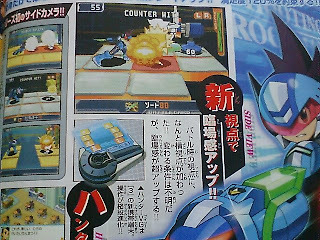 There is also a new Mega Card with an attack power of 100 that features War Rock cutting and tearing through enemies. The threat in this game appears to be a large meteor headed on a crash collision with Earth, referred to as Meteor G.
A character referred to as Spade Magnets will appear in this game. He is described to be a a Wizard, originally meant to help people, but he has become corrupted by Noise radiating from Meteor G. Sounds like a first boss. RnR3 is sure sounding better and better. Stay tuned for scans. I like the new buster! And I think Duo's back! Think, Big meteor, headed for earth, going to destroy, And since it's radiating waves it must not be a real meteor right? Just like Duo's meteor. Now that I've gotten a look at the new Noise forms, all I have to say is: badass. Why is Capcom so obsessed with the "a-space-object's-gonna-pwn-Earth" story? We've got Eurasia in X5, Duo in EXE4, a satellite in the EXE anime, another satellite in the Ryuusei no RockMan anime - does it ever end? Grief! Oh, well, at least the Noise Change thing's kinda cool - not what I hoped for, but okay. I hate the new transformation phrase, though! "EM Wave Change! Geo Stelar! On the Air!" What's wrong with that? I CALLED IT! Or at least, if it is side-view. That would be SOOO much better. I wondered when they'd start doing soul unisons. As much better as this is looking, I still miss the EXE series and it's more awesome design. :( Well, this is looking up! I've never played the DS versions of these games. They any good? I enjoyed the Battle Network games. Well, up until 4 anyway. Well, fans speculate that the Meteor is Duo returning once again. As for the phrase.. it makes sense, he's no longer doing an EM Wave Change with an EM-Alien the way he used to, so it isn't considered a wave change. Very interesting... thats all i really can say. I'm kind of glad that they're changing it from denpa henkan. It never made sense. I think it's Duo's meteor returning, (it'd be a good idea if you ask me) and I think this is how RnR should've been from the beginning. (However, all this doesn't change the not-as-awesome designs as EXE and the extra "emo-ness" of these games.) Reggie White Jr: These are acceptable games, but nowhere NEAR as good as the EXE series. Hopefully this third entry will be slightly better.